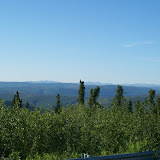 Eagle Summit is at 108 mile Steese highway and it's about 2hr drive from Fairbanks. 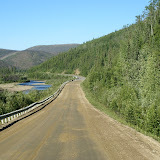 Long and winding dirt road. It's a good road, we had a smooth ride through it. Sharing the fire and food to the strangers. The weather was good but it's pretty windy up there. At the top of Eagle Summit. These are the people who were trying to capture the sun at its lowest setting. Wonderful, wonderful photographs, beautiful views and even the dogs were cute, Loved the post. Gorgeous photography...so for how long don't you have dark nights? Beautiful pics! Love seeing Alaska through your eyes. wow, all these photos are really really amazing!!!! lol, i love the pix of your dogs looking over the side of the car.